Here’s good news for those of us who are based in Asia, Google is increasing the capacity of its two data centers the region. That means better performing sites and services for those of us near to its facilities in Singapore and Taiwan. 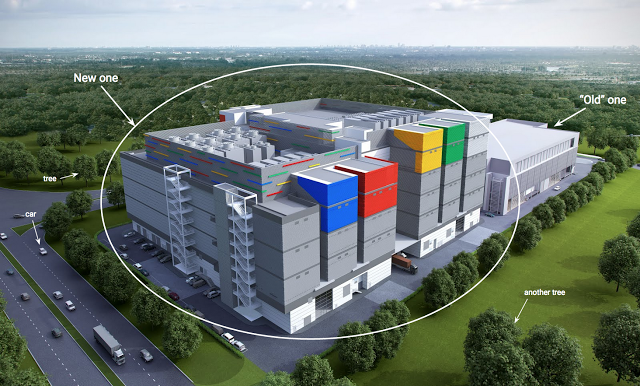 The U.S. company today announced that its data center in Singapore, which opened its doors just 18 months ago, will be extended with the addition of a “a second, larger, multilevel data center” right next door. This expansion will take Google’s spending on its Singapore site to $500 million which, combined with the $600 million it allocated to Taiwan, takes it past $1 billion for Asia. The new center in Singapore is due to be completed and online in two years. For now, Google has shared a colorful but “not final” rendering of what it could look like — the most important part, however, is that it will help Google websites and services load faster across Southeast Asia, India and the wider Asian region. Google also appears to be planning a further expansion to its other Asia-based data center, which is in Taiwan and opened in 2013. Media reports last year speculated that the company would invest $66 million to increase its capacity — following an earlier $100 million expansion. A Google representative declined to comment on plans for the site in Taiwan when we asked, but the company did openly it would expand the site — which is located in Changhua County — when it was announced in December 2013. These expansions are particularly interesting given that Google abandoned plans for a third data center, located in Hong Kong, back in 2013. (That was a busy year for Google data centers in Asia.) Given real estate prices in Asia, expanding its existing sites over time may have been preferable to establishing an entirely new one — Google declined to comment on that, however. Google’s data centers don’t exclusively serve customers in their immediate proximity, centers in the U.S. and Europe also serve Asia and those in Asia can serve the U.S. too, but users who are located close to a data center do enjoy faster running services. So, while Google’s Asia-based users aren’t solely reliant on these expansions, they are most definitely good news. The U.S. company is beefing up its server capacity across the world — a $600 million center just went online in Oregon — but the rise of mobile internet in Asia has made expansions in the region particularly important. India alone is thought to have added 40 million new internet users during the first half of this year, which gives an indication of the increased load that Google and other companies are dealing with.